[TIP #1] Know that small things can yield big results. In the majority of happy and healthy marriages, both partners feel cared for, appreciated and “special.” This is a quality of the relationship shared by marriages that last long-term. Just telling your spouse “what” you appreciate about them and “why” you love them on a regular basis can increase overall happiness in the relationship and help to prevent divorce. It is actually the men who seem to need affirmations more than women! Research suggests that men who don’t feel affirmed by their wives were twice as likely to be involved in a divorce. How can this be? Consider the fact that women are much more likely to affirm one another in their friendships and compliment one another than are men in their friend relationships. Men just don’t “affirm” other men on a regular basis. Ephesians 5:33 challenges men to make sure they [love] their wives (=do whatever it takes to communicate and express that which makes them feel “loved.”) and that wives see that they [respect] (=do whatever it takes to communicate and express that which makes them feel “loved.”) their husbands. What if maintaining mutual love and respect was not as complicated or hard as you thought it was? What if all we need to do is make each other feel valued, appreciated, accepted, and “special?” If that were true, then it could be that we have the ability to strengthen our marriages daily, without any financial expense, and without excessive effort or the loss of large quantities of time. Start here: Tell your spouse every day that you love them. Tell them every day something that you love about them and compliment them regularly. This simple activity will help your love last. 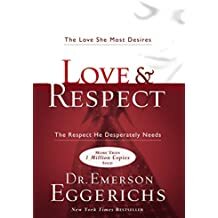 If you want to learn more about the concept of what communicates love to men and women, I highly recommend the book, “Love and Respect” by Dr. Emerson Eggerichs.